Adolphus Cambridge, 1st Marquess of Cambridge, GCB, GCVO, CMG, ADC(P) (Adolphus Charles Alexander Albert Edward George Philip Louis Ladislaus; 13 August 1868 – 24 October 1927), born Prince Adolphus of Teck and later The Duke of Teck, was a relative of the British Royal Family, a great-grandson of King George III and younger brother of Queen Mary, the wife of King George V. In 1900, he succeeded his father as Duke of Teck in the Kingdom of Württemberg. He relinquished his German titles in 1917 to become Marquess of Cambridge. Prince Adolphus of Teck was born on 13 August 1868 at Kensington Palace, London. His father was Prince Francis, Duke of Teck, the eldest son of Duke Alexander of Württemberg and Countess Claudine Rhédey von Kis-Rhéde (created the Countess von Hohenstein). His mother was the Duchess of Teck (formerly Princess Mary Adelaide of Cambridge), the youngest daughter of Prince Adolphus, Duke of Cambridge, and a granddaughter of King George III. Adolphus was styled His Serene Highness Prince Adolphus of Teck at birth. With a string of nine Christian names, among his immediate family he was always known as "Dolly", a pet form of 'Adolphus'. He was educated at Wellington College in Berkshire. Prince Adolphus was a cavalry officer, following in the footsteps of his father, both of his grandfathers, and his maternal uncle. He received his education at Wellington College, before entering the Royal Military College, Sandhurst. At the age of 19, in April 1888, he was commissioned into the British Army as a second lieutenant in the 17th Lancers, the regiment of his maternal uncle, HRH The Duke of Cambridge, who was the commander-in-chief of the British Army from 1856–1895. He was promoted lieutenant in January 1893, and transferred to the 1st Life Guards as a captain in June 1895. He was created a Knight Commander of the Royal Victorian Order (KCVO) in 1897, and promoted to Knight Grand Cross of the Royal Victorian Order (GCVO) in 1901. Prince George of Teck, later 2nd Marquess of Cambridge (11 October 1895 – 16 April 1981); married 1923 Dorothy Hastings (18 May 1899 – 1 April 1988). Princess Mary of Teck, later The Lady Mary Cambridge (12 June 1897 – 23 June 1987); married 1923 the 10th Duke of Beaufort (4 April 1900 – 4 February 1984). Princess Helena of Teck, later The Lady Helena Cambridge (23 October 1899 – 22 December 1969); married 1919 Colonel John Evelyn Gibbs (22 December 1879 – 11 October 1932). Prince Frederick of Teck, later styled Lord Frederick Cambridge (23 September 1907 – 30 May 1940). In January 1900, Adolphus succeeded his father as Duke of Teck. The new Duke served with his regiment during the Boer War 1899–1900, for which he was promoted Brevet major in November 1900. He was later a transport officer in the Household Cavalry. In February 1904, he was promoted to the temporary rank of lieutenant-colonel and appointed a temporary military attaché at the British embassy in Vienna. His appointment as military attaché was confirmed in April 1906, and he received a staff posting the same month. He was promoted to the substantive rank of major in December 1906, and was raised to brevet lieutenant-colonel in November 1910. With an Order in Council dated 9 June 1911, his brother-in-law King George V, as a gift to mark his own Coronation, granted his cousin the style His Highness, which echoed the gift of the King's grandmother, Queen Victoria, to the Duke's father. The same year he was made a Knight Grand Cross of the Order of the Bath (GCB). From other nations he received the grand cross of the Order of the Red Eagle of Prussia, the Order of the Iron Crown of Austria, and the grand cross first class of the Order of the Star of Romania. He was appointed Honorary Colonel of the 8th Battalion, London Regiment, known as the Post Office Rifles in 1912, relinquishing the position in 1923. From 1914 to his death he was Governor and Constable of Windsor Castle. With the outbreak of the First World War, he returned to active duty, receiving a promotion to substantive lieutenant-colonel in November 1914. 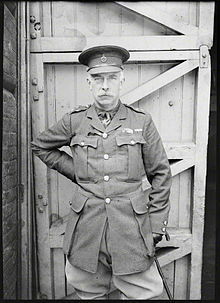 He first served as assistant military secretary at the War Office, and from December 1915 as military secretary to the commander-in-chief of the British Expeditionary Forces (BEF) in France, Sir Douglas Haig, with the temporary rank of brigadier general. He received from allied nations the Belgian Order of Leopold (Grand Cordon) and Croix de guerre, as well as the French Legion of Honour (Grand Officer). Following ill-health he was placed on half-pay in July 1916, and retired pay in 1919. During the First World War, anti-German feeling in the United Kingdom led Teck's brother-in-law, King George V, to change the name of the Royal House from the Germanic House of Saxe-Coburg-Gotha to the more English-sounding House of Windsor. The King also renounced all his Germanic titles for himself and all members of the British Royal Family who were British subjects. In response to this, Teck renounced, through a Royal Warrant from the King, dated 14 July 1917, his title of Duke of Teck in the Kingdom of Württemberg and the style His Highness. Adolphus, along with his brother, Prince Alexander of Teck, adopted the name Cambridge, after their grandfather, Prince Adolphus, Duke of Cambridge. He was subsequently created Marquess of Cambridge, Earl of Eltham, and Viscount Northallerton all in the Peerage of the United Kingdom. His elder son took the title Earl of Eltham as a courtesy title. His younger children became Lord/Lady (Christian Name) Cambridge. Vera Bate Lombardi, Coco Chanel's muse and PR representative, was rumoured to be Adolphus' illegitimate daughter. Hal Vaughan, in his 2012 biography of Coco Chanel ('Sleeping with the Enemy: Coco Chanel's Secret War', p. 42), describes Vera Bate Lombardi as a 'cousin and childhood friend' of Edward, Prince of Wales. Lord Cambridge made his home in Shropshire after World War I at Shotton Hall, Harmer Hill, near Shrewsbury. He was active in social life in the county, of which he became a Justice of the Peace and Deputy Lieutenant in 1923, and Treasurer of the Royal Salop Infirmary at Shrewsbury in 1925. He hosted visits by his sister in the county, the last in his lifetime being a public visit to Shrewsbury and other parts of Shropshire in August 1927. During that period[year needed] Lord Cambridge was considered as a candidate for the then vacant throne of Hungary. He declined the invitation, having treated the idea with some amusement by remarking "Don't you think I would make a nice looking King?" Lord Cambridge died, aged fifty-nine, after an intestinal operation in October 1927 at a Shrewsbury nursing home, while preparations were being made for another public royal visit to the town (which was consequently cancelled) by his nephew, the Prince of Wales (later King Edward VIII). He was first buried at St George's Chapel and later transferred to the Royal Burial Ground, Frogmore. His elder son, the Earl of Eltham, succeeded him as Marquess of Cambridge. A Dog's Head and Neck lozengy bendy sinister Sable and Or, langued Gules. Quarterly: 1st & 4th grand-quarters, The Royal Arms as borne by King George III, differenced by a Label of three-points Argent, the centre point charged with a Cross Gules, and each of the other points with two Hearts in pale Gules; 2nd & 3rd grand-quarters, Or, three Stags' Attires fesswise in pale, the points of each Attire to the sinister Sable, impaling Or three Lions passant in pale Sable, langued Gules, the dexter forepaws Gules; over all an Inescutcheon lozengy bendy sinister Sable and Or (Teck). Dexter: a Lion Sable, the dexter forepaw Gules. ^ "No. 26366". The London Gazette. 24 January 1893. p. 412. ^ "No. 26637". The London Gazette. 25 June 1895. p. 3592. ^ a b "No. 27281". The London Gazette. 5 February 1901. p. 765. ^ "No. 27359". The London Gazette. 27 September 1901. p. 6304. ^ "No. 27661". The London Gazette. 25 March 1904. p. 1948. ^ "No. 27906". The London Gazette. 20 April 1906. p. 2747. ^ "No. 27910". The London Gazette. 4 May 1906. p. 3078. ^ "No. 27975". The London Gazette. 11 December 1906. p. 8728. ^ "No. 28438". The London Gazette. 18 November 1910. p. 8789. ^ Burke's Peerage, Baronetage and Knightage, 1913. Burke's Peerage Ltd. p. 38. Section The Royal Lineage, under descendants of George III. The German and Austrian orders were not listed in his entry after World War I, having apparently renounced them as honours of then enemy countries. ^ "No. 28629". The London Gazette. 23 July 1912. p. 5422. ^ a b c Kelly's Handbook of the Titled, Landed and Official Classes. Kelly's Directories. 1926. p. 333. ^ "No. 28969". The London Gazette. 10 November 1914. p. 9133. ^ "No. 29218". The London Gazette. 6 July 1915. p. 6583. ^ "No. 29476". The London Gazette (Supplement). 16 February 1916. p. 1777. ^ a b c d e "'Death of the Marquess of Cambridge'". Shrewsbury Chronicle. 25 October 1927. p. 7. ^ "No. 29771". The London Gazette (Supplement). 2 October 1916. p. 9536. ^ "No. 31639". The London Gazette (Supplement). 11 November 1919. p. 137654. ^ a b c "No. 30374". The London Gazette. 9 November 1917. pp. 11592–11594.